Friday, 09. September 2011 As one of the leading additive manufacturers of light colored sulfur carriers worldwide Rhein Chemie has widened its portfolio by a product range of new sulfur carriers. Mannheim – As one of the leading additive manufacturers of light colored sulfur carriers worldwide Rhein Chemie has widened its portfolio by a product range of new sulfur carriers. The extreme pressure additive Additin® RC 2519 is the first product of this new generation. These new sulfur carriers are very well coordinated with today’s needs of metalworking processes and they support Rhein Chemie’s leading market position as innovative manufacturer of additives for the lubricant industry. Additin® RC 2519 allows to address a further large segment of the market in the field of metalworking. “For many years now we have been trying to develop an appropriate alternative product in order to replace certain polysulfides from Arkema. We are convinced that there is an enormous global potential here and that the customer’s demand will be big. We are now one big step closer to addressing this segment of the market and are more than happy to be able to introduce our new Additin® RC 2519. 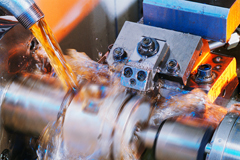 It is especially due to the good price/performance ratio and optimized synergistic properties with other additives in many applications of metalworking that we are certain that this is the right time to convince our customers, who are currently still buying products from the competition”, says Thomas Dittmar, Global Product Manager Division Lubricant Oil Additives. Additin RC 2519 is a light colored, reduced odor and reduced viscous sulfur carrier which is based on plant-based fatty acid esters and olefins. In the next months, three further products of the new generation of sulfur carriers will be introduced on the market.